My friend Elinor told me I had to go here when I visited New York. And this was one of the best recommendations. 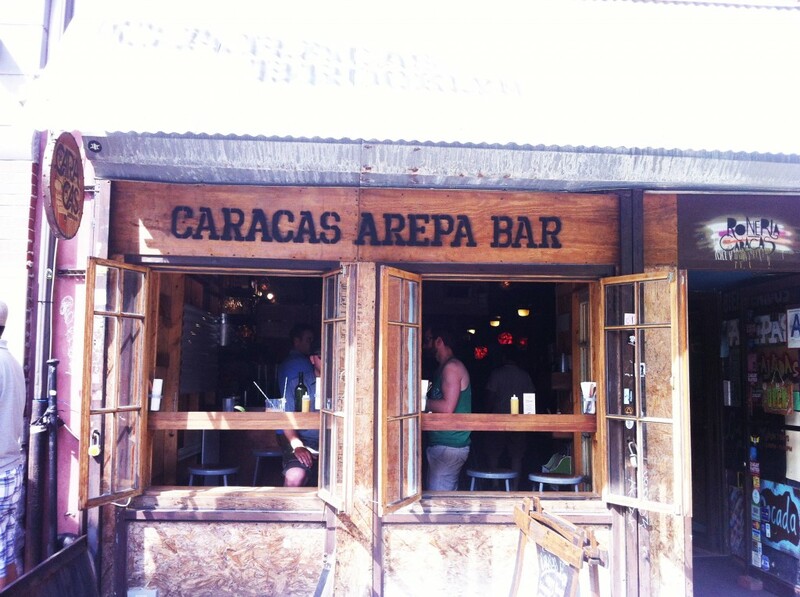 Tucked behind the main streets in Williamsburg, Caracas Arepa Bar is a great experience. 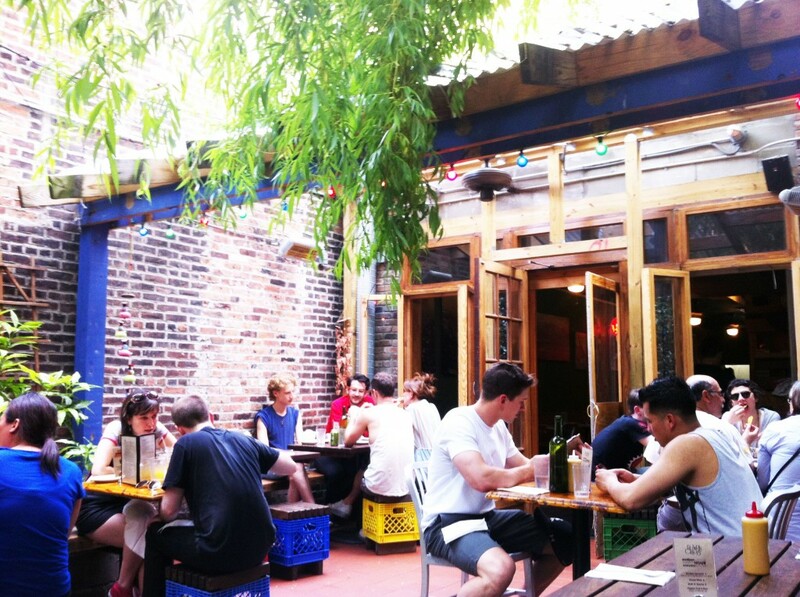 It’s hip, but not too hip – and the food is truly delicious. The Brooklyn restaurant follows on from the the first Caracas Arepa, which opened in East Village in 2003 (and a new one has just opened in Rockaway). 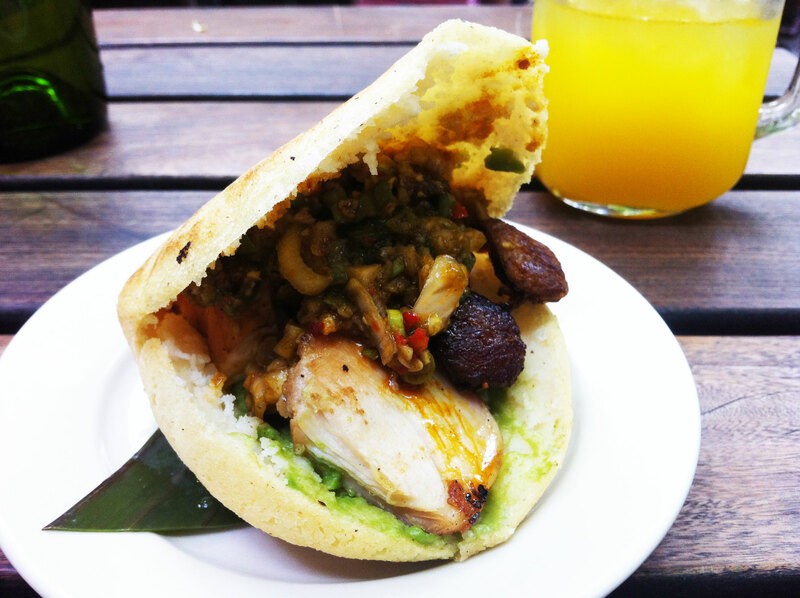 Its name showcases the arepa, which is a Venezuelan corn muffin/bun. These are gluten-free and usually crisp on the outside and soft in the middle because they’re baked and grilled. They can be plain or filled – and can be a snack or a main meal, or even a breakfast. There are 12 variations of the Arepa on the main menu – and usually Brunch Arepas with Perico (Venezuelan-style scrambled eggs) and a Special, too. Most of them have wonderful-sounding fillings such as the La de Pernil (Roasted Pork Shoulder, Tomato Slices and Spicy Mango Sauce), or the Playa Deluxe (Pan-Seared Tilapia with Garlic-Infused Oil, Sautéed Mushrooms, Avocado Slices, Pickled Onions and Homemade Herb Mayo). I chose the La Sureña (Grilled Chicken, Hearty Chorizo with Avocado Slices and the Classic and Always Enigmatic Spicy Chimi-Churri Sauce). It was completely delicious. Chicken, chorizo and avocado are classic pairings – and always good – and these worked really well within the corn casing and with the fantastic spicy sauce. One arepa is not enough. Truly. Even if you’re already full, they taste too good to not try something else. 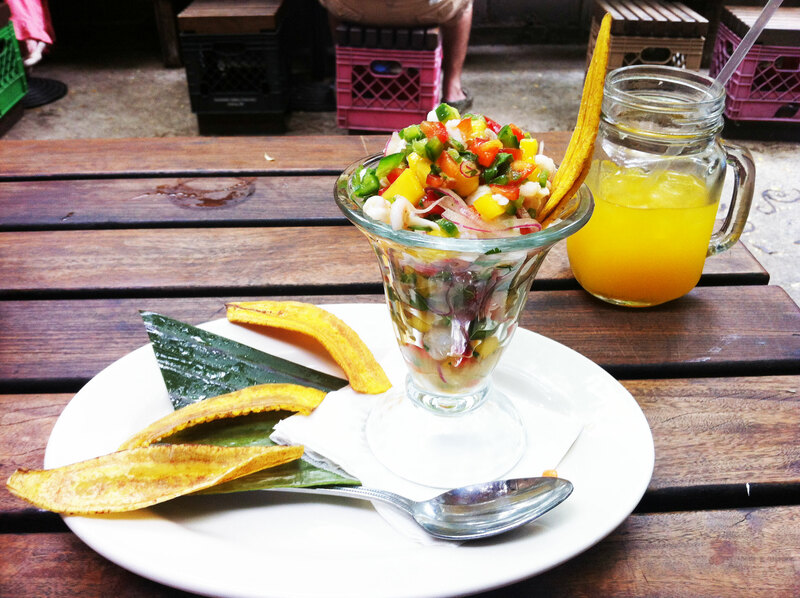 So I did… The Ceviche de Camarón proved irresistible. Shrimp Ceviche with Purple Onions, Green Mango, Red Peppers, Jalapeño, Cilantro and Lime, with Plantain Chips. As they say – summer in a glass. The soft, marinated shrimp with the crunchy onions and pepper were spicy and delicious – and the lime was beautifully balanced. On top of this were fantastic sweet/salty plantain chips. The staff are assured and knowledgeable about gluten-free/dairy-free. And there’s a great choice of dishes for free-from customers. It usually takes a while to get a table. When I went, during the day, there were a whole load of empty tables, but I was still made to wait for 20 minutes until I was taken to a table. And the evenings get very, very busy, apparently – with loooong queues. But, like many places where you have to wait, it’s definitely worth it. Caracas Arepa Williamsburg is at 291 Grand Street, Brooklyn, NY 11211.